A romantic survival thriller featuring two big Hollywood stars and set against the power of Mother Nature herself. No, it's not a sequel to The Mountain Between Us, thank goodness. 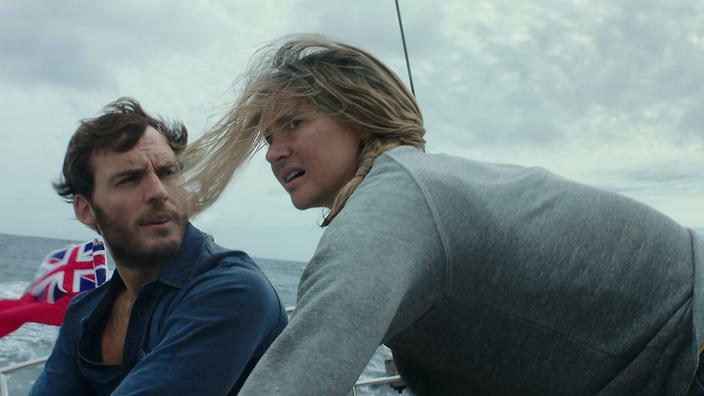 It's Adrift, which stars YA favorites Shailene Woodley (Divergent) and Sam Claflin (The Hunger Games) as a couple stranded in the middle of the Pacific Ocean. Directed by Icelandic filmmaker Baltasar Kormakur, who directed previous survival stories The Deep and Everest, the film is based on the true story of Tami Oldham and her fiancé Richard Sharp who hit a monumental storm while sailing in the Pacific Ocean. In the aftermath Tami wakes up to find their boat destroyed and Richard near death, and she must find the strength to survive and rescue the only man she has ever loved. They should be fine. I saw Robert Redford survive worse all by himself in All is Lost. So surely Woodley and Claflin can do the same? Do yourself a favor and try to avoid reading up on the actual events surrounding Oldham and Sharp's struggle. Based on the trailer it looks like some of the facts are being tweaked to make for a "better" Hollywood story. Also starring Elizabeth Hawthorne and Jeffrey Thomas, Adrift sails into theaters on June 1st.